CD rates are climbing, but before getting one, consider how a CD fits your savings and investing goals. Rates on certificates of deposit are finally rising. If you’re looking to kick-start your savings strategy, consider adding CDs to the mix. CDs are seen as safe bets for saving or investing since they are federally insured and returns are guaranteed. And when CD rates go up, as they have in the past year, you’ll earn more money. 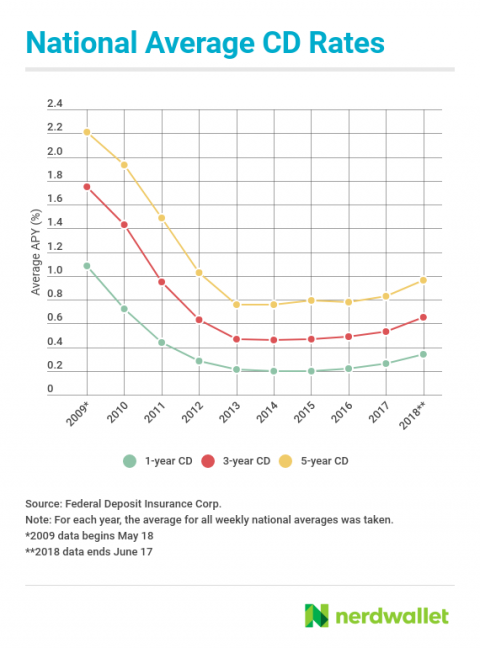 For people who have been disappointed by CDs in the past, this could be an optimal time “to bring them back into their rotation,” says Robert Frick, corporate economist at Navy Federal Credit Union. But locking up funds in CDs for months or years isn’t the best move for everyone. Here’s a closer look at why CD rates have climbed, and whether getting one right now makes sense for you. CD rates took a big hit after the financial crisis, and they have remained low for a while. That started to change at the end of 2015, when the Federal Reserve made the first of several rate increases. Fed rate hikes are one of many factors banks and credit unions consider when setting rates. Top CD rates are typically higher than the best rates on savings accounts. The best five-year CDs, for example, can come with rates near or even above 3%. Rates on the best savings accounts, meanwhile, currently max out at about 2%. But just because CDs tend to offer some of the highest guaranteed returns doesn’t automatically make them the best home for your savings or investments. Building short-term wealth: CDs with short terms, such as one or two years, can make sense if there’s a plan to later invest that money. For example, if you want to invest a large sum in the market, you might spread out when you buy stocks or funds over time using a popular investing strategy called dollar-cost averaging. The money waiting to be invested could go into CDs to earn more interest than it would in a regular savings account. Ensuring returns without risk: Investing in long-term CDs is generally best for people, typically retired, who want to avoid risking their money in the stock market. They also want to stop their savings from eroding because of inflation. If rates sound good right now and CDs work for your situation, be sure that you’re comfortable with two potential downsides. Early withdrawal penalties. If you end up needing money that’s in a CD and you withdraw it before the term expires, there’s usually a penalty that cancels out some or all the interest you’ve earned. For that reason, it’s best to let CDs expire naturally. Another solution: find a bank that offers no-penalty CDs where you can withdraw funds without losing the initial deposit or interest. Missed opportunities for higher rates later. CDs generally have fixed interest rates. Being able to lock in a high APY now means you don’t have to worry about rates dropping. But if rates keep rising, you risk losing out on higher returns. “There’s an opportunity cost when rates go up,” says Mario Hernandez, certified financial planner and principal at Gemmer Asset Management. CD ladders can be a useful strategy in a rising-rate environment. 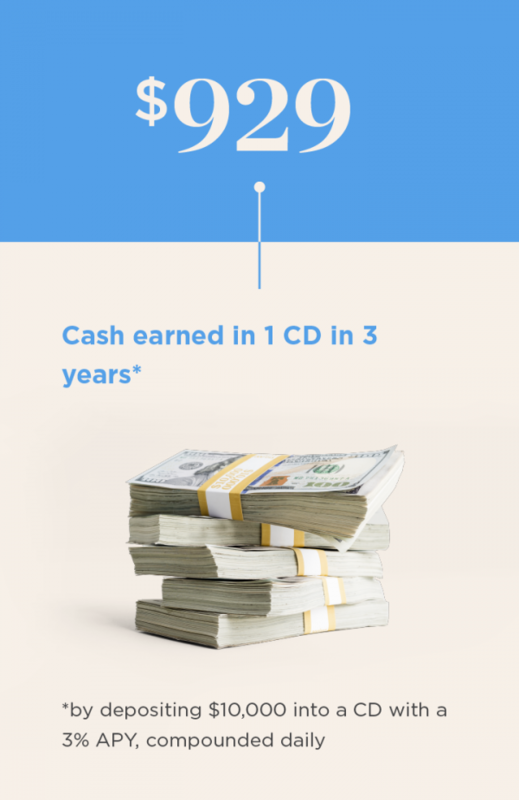 A CD ladder is a way to spread out a large amount of money into multiple CDs of varying term lengths, such as one year, two years and three years. When each CD expires, you either withdraw funds if you need them or reinvest in another CD. If your bank has raised rates since you started the ladder, you benefit from higher rates with each new CD.